Have you been told there's a little too much telling in your novel? Want to remedy it? Then this is the book for you! If you purchase the e-book, you will be armed with the convenient hyper-linked Contents Page, where you can toggle backward and forward from different scenes with ease. Use your e-reader's highlighting and note-taking tools to keep notes instead. Jessica Bell is an Australian-native contemporary fiction author and poet who resides in Athens, Greece. She makes a living as an editor and writer for global ELT publishers (English Language Teaching), such as Pearson Education, HarperCollins, Macmillan Education, Education First and Cengage Learning. She is also the Co-Publishing Editor of Vine Leaves Literary Journal, and co-hosts the Homeric Writers’ Retreat & Workshop on the Greek Isle of Ithaca, with Chuck Sambuchino of Writer's Digest. 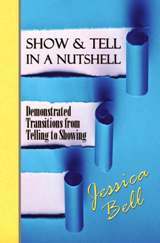 For more information about Jessica Bell, please visit her website: www.jessicabellauthor.com.